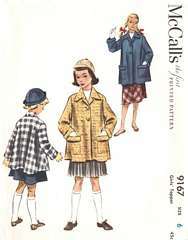 Vintage McCall's sewing pattern 9167. Slightly flared style topper coat in below hip length. Two button front closure. Patch pockets with flaps. Pattern is uncut and complete. Envelope is in near mint condition.